This 500 piece puzzle of the United States of America is unique because it is actually 50 smaller individual puzzles one for each state. After creating the states, you can start to combine them to build the USA. As you finish the continental U.S, your end result will be a combined puzzle that obviously ends up to be in the shape of the U.S. as a whole. Alaska and Hawaii are actually separate puzzles altogether rather than your standard maps that place down in the corner of the image. 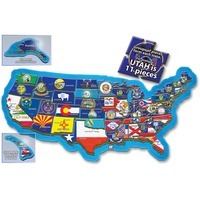 Each state is overlaid with its own flag to help serve as a guide and a continuing educational experience. Every state's capital is labeled and marked in its location.